Interlift 2017 was bigger than ever and presented the innovations of the elevator world market. This is the leading meeting place for the sector and the highlight of the year for all decision-makers. 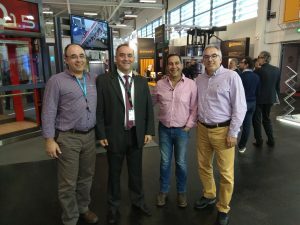 Q-CERT people visited the Fair and met the up-to-date technologies. Most of the Interlift 2017 exhibitors are smaller or medium-sized manufacturers of lift components, highly specialized and often active on a worldwide scale. Interlift 2017 has a wide range of lift systems and prefabricated components, escalators and moving walkways, parking systems, transmission units, steering and controlling systems, surveillance and safety systems, cabins, doors, cables, operating and display elements, hydraulics and accessories. In addition to this, international associations and media of the lift branch were also present at the Fair. Q-CERT (“QMSCERT”) provides certification services to the whole sector of the lift technologies.